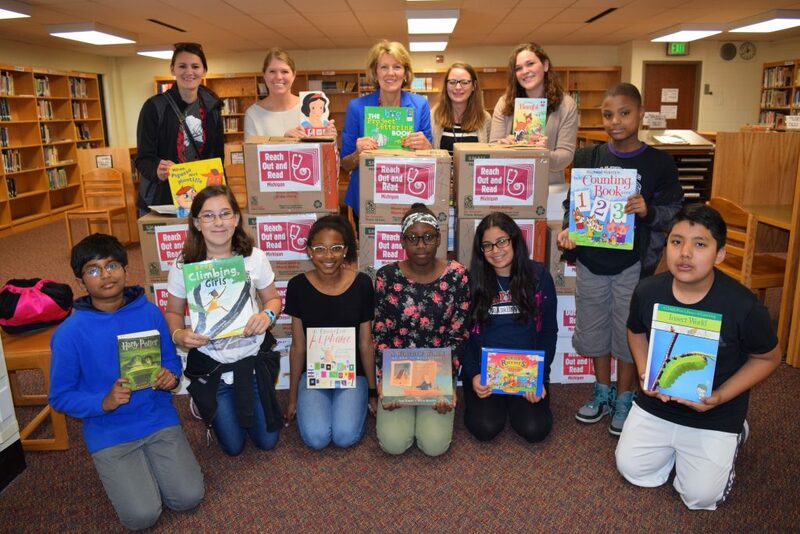 Scarlett teacher Susan Schmidt (in blue) stands with Rosa Ball and others from U-M’s Reach Out and Read program, while members of the Make a Difference Club hold a few of the 2,090 books they collected. Thanks to the hard work of eight Scarlett Middle School sixth graders in the Make a Difference Club, hundreds of local preschoolers and their families will receive gently used books and learn that reading is part of a healthy childhood. 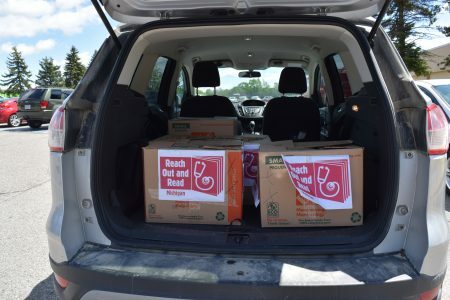 The students have collected 2090 books from Scarlett students and staff for the Reach Out and Read program at the University of Michigan, which provides books for children at local clinics. Aaliyah Diarra, 12, said she was eager to join the Make a Difference Club when she heard about it at the start of the school year. Reach Out and Read, a national program with a chapter at U-M’s Center of Human Growth and Development, prepares preschoolers to succeed in school by partnering with doctors to prescribe books and encourage families to read together. Health practitioners advise parents about the importance of reading aloud with their children every day and give developmentally appropriate books to children. Scarlett teacher Susan Schmidt was involved with the program when she worked in Lansing, and was happy when the Scarlett students this year were eager to do their part. Schmidt, who teaches language arts and literacy to learning-disabled students and advises the Make a Difference Club, helped the students make informative Power Point presentations, which they then presented to all home rooms. “This was a lot of work on their part,” she said, standing beside boxes of donated books. Maryam Fasina, 12, agreed that she and the other students worked hard all year to make the book drive successful. After sorting through the books to choose those that fit the criteria of the program, Scarlett donated more than half to Reach Out and Read Clinics. The rest will go to charitable organizations. 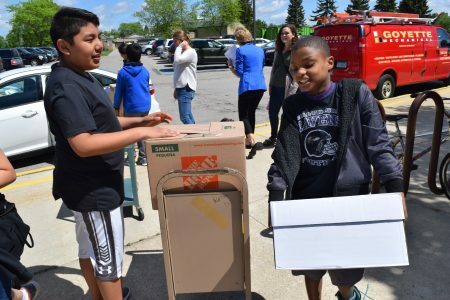 Rosa Ball, who coordinates the Reach Out and Read program at U-M, said she’s impressed with all the work the sixth graders donated to the cause.